On this first Monday of the new year, I’d like to talk about resolutions. It’s around this point, after the first weekend, when things get busy, where we learn whether our resolutions are possible. Well, this is the year not to slack off. 1) We’re at a critical point where our decisions could win or lose this high stakes game to save the economy. 2) This is our final year to define this first decade of the new century. Thus far, this decade has been defined by tragedy and political missteps. So while we’re trying to sustain our resolutions to eat less, drink less, read more, etc., we should add 5 more to the list. And these 5 resolutions shouldn’t be for the coming year alone; we should hold these resolutions as lifestyles. Illinois Gov. Rod Blagojevich was taking into custody today. The hot search today is for the governor’s arrest. Political junkies will have been watching the governor very closely because he was the person who chooses Obama’s successor in the Senate. The best candidates for the job have been the governor’s harshest critics. Now it’s a good thing he’s out of the picture. It turns out that he was actually trying to sell the Senate seat to the highest bidder. What a dirty crook! In fact he said that the Senate seat “is a valuable f*cking thing. You don’t just give it away for nothing.” POTTY MOUTH! He takes up 5 slots in the top 10 on Google Trends. And I bet he’s trying to buy the other slots, the stinking thug. Today, President-Elect Barack Obama met with President Bush to discuss private matters and ease the transition of power in January. 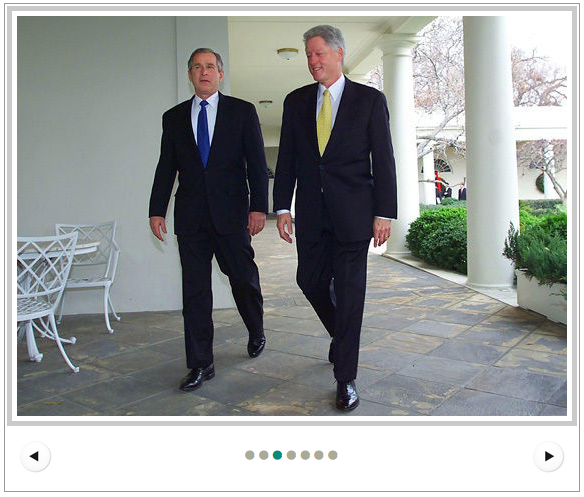 Huffington Post posted some photos of the same event happening between Bush and then President Clinton. I’m sure the 2000 meeting was a little bitter after Gore lost, but definitely not as dire as today’s meeting between our nation’s leader and future leader. I’m sure the economy took center stage in the discussion, whereas Bush and Clinton’s meeting was probably over foreign policy. Spears and her family were relaxing at their Louisiana Serenity estate when Jayden had a seizure and was described as being “vague and unresponsive.” When Spears was told that an ambulance would take a half-an-hour to arrive (WTF?) the Spears clan mobilized and sped to the hospital in two black SUVs, one driven by Britney and carrying her parents and son, the other drive by Jamie-Lynn with brother Brian as a passenger.